The logical alternative to the presently followed methods of sugarcane harvesting. 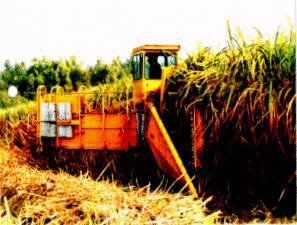 Cameco Sugar Cane Harvester with the harvesting capacity of 75 Tonnes in 1 Hour. Caterpiller turbocharged diesel heavy-duty engine for a long and trouble free life. Adjustable slow forward speed for efficient operation in rough fields. Piles up to 6 rows of cane in one heap, reducing loading time, soil compacting and damage to stubble. Tops can be shredded as they are cut from the stalk, for speedier decomposition.